​​On the afternoon of October 3, 2015, an explosion in a three-story building in Borough Park, Brooklyn, killed one person and injured eight others. Within moments of the initial 911 call, all members of the New York Rescue Response Team (NYRRT) were alerted via a text message to their “hotline” by a fellow NYRRT member who happened to be working as the primary radio dispatcher at Citywide Disaster Services (CDS)—the official back-up dispatch center for the Regional Emergency Medical Services Council of New York City (REMSCO). With that alert, Captain David Spira of NYRRT responded. About the same time Captain Glen Schneider of NYRRT arrived. Spira assisted the FDNY with entering into an adjacent occupied building (behind the fire building). This was an opulent home where a large Yiddish-speaking family resided. As the FDNY entered to check for fire-related damage, Spira spoke to the family while translating for the FDNY. Glen Schneider brought a FDNY chief into the family’s upstairs bedroom as it was found to be a location where the chief could watch his men attacking the fire on the roof below. Lieutenant Shelomo Alfassa, the NYRRT Public Information Officer, arrived about 15 minutes post-explosion. He, along with Schneider, helped calm the large curious family who had many firemen walking into their home. Schneider took mitigation measures to minimize smoke in the home, closing doors and setting up fans to blow smoke and charred wind-strewn debris back outside. As water and smoke was blown into the home, Alfassa coordinated with an American Red Cross representative that was on 13th Avenue, to meet with the family and attend their needsAs the evening went on, NYRRT members delivered two light towers / generators to the scene as a stand-by resource for any agency that needed them. During the night, many EMS, fire and police officers were stationed to keep watch on the scene. NYRRT brought other equipment (tables, coffee pot, electrical cords, food, water, etc.) to the scene. NYRRT provided electrical power to 13th Avenue where an impromptu canteen was set up—the only place to get a drink or coffee, etc. within the fire line. NYRRT member Miriam Nockenofsky worked the table and assisted the many fire and police officials that came by for a hot cup of coffee, a bottle of water or a snack throughout the evening. 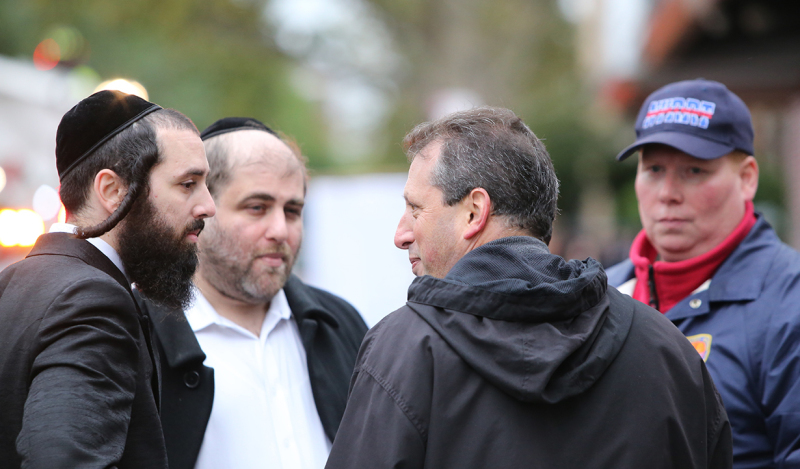 As the night went on David Spira continued to translate and ease the concerns of the locals. He became the defacto conduit between the FDNY and the hundreds of residents that were in the street watching the fire operations. He checked in with OEM on-scene and offered lighting and anything else they may need. Schneider and Alfassa continued to update all the members of NYRRT, and to coordinate schedules to ensure there would be coverage around the clock for the next few days on-scene. That night, NYRRT had representation on scene until morning, and then representation for the next several days around the clock.